With the advent of the 1930s, the story of Coxmoor was preparing for another important chapter. While other courses have tinkered with various holes over the years, moving tees, re-shaping greens, adding and removing bunkers, Coxmoor has undergone a number of major re-designs to arrive at the nurse we know today. The most important move, as far as members were concerned, was to get the course contained on one side of Coxmoor Road. And the key to the sort of future envisaged by the membership, was acquiring more land so that a new course of 18 holes could be laid out around the clubhouse. Negotiations between the Coxmoor officers and the management of Welback Estates continued off and on until 1934 when agreement was reached to lease more land on the clubhouse side of Coxmoor Road. In September of that year Mr Williamson met a delegation of directors and committee on the course, showed them his vision for Coxmoor and asked for their opinions. The committee was unanimously in favour and Tom Williamson was given the job of creating the new Coxmoor - the foundations for the course we know today were finally being laid. Once again, Tom teamed up with Len White to build the new course, using old Ted Fish's tractor and some tried and trusted methods which today would seem primitive to say the least. Where language was whispered with much froth and spleen. You made a bright scene, when with green you were decked. Till old age and decay your beauty they checked. Be it said of us all, "Your task was well done." In those days grass for the fairways wasn't purchased by the sackload from some local garden centre or seed merchant, it was collected by literally hand-stripping it from the fescue growing naturally over the land - the same thick, wiry grass that today claims so many lost balls! The seed was then spread over the fairways and fertilised by the barrowload ... after the fertiliser had been collected by some of the greenkeeper's lads, in wheelbarrows, and pushed all the way from Sutton gas yard in Fox Street. It produced very different ground conditions to the ones that we know today. The fairways were hard and fast and balls would bounce along for great distances. A bunker had to be laid along the length of the 16th fairway to prevent shots running out of bounds. Today, that bunker is overgrown and full of trees, but ball hunters can easily discern its shape and depth as they cast around beneath the branches. 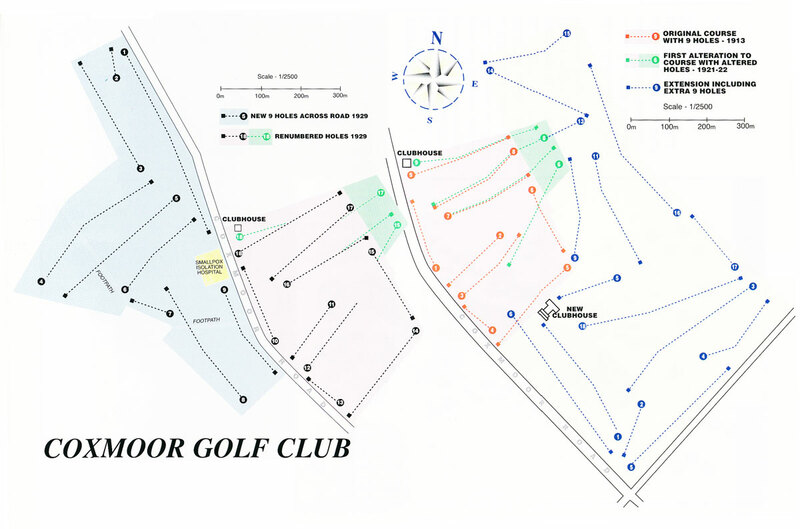 The original layout was also different to the one we play today - as can easily be seen by referring to Bill White's map. For instance, the present ninth green was originally the fifth, and the seventh green is now the 12th. The course, for the most part, was devoid of trees, and so was open to the elements which, at this highest point in the county, would often be windy and cold. Aside from the natural problems of wind and terrain, they had to cope with equipment still awaiting the explosion of technological development which began slowly after the war and has since gathered pace at a rate the pocket can barely keep up with. The clubs were often made by the professional whose main role in life at that time was the repair and maintenance of equipment. Clubs were made with hickory shafts and steel heads which were always going rusty. The club pro had a never-ending job of replacing worn parts. In each player's canvas and leather carrying bag would be a number one wood, a brassie (number two wood), spoon (number three wood), mashie (five/six iron), mashie niblick (eight/nine iron), niblick (wedge) and perhaps a driving iron. They faced holes which were much shorter than the current design, with the longest at around 300 yards. But using those old clubs and the gutta percha balls, the very best players would be happy to carry 180 yards. Mention of the gutta percha is perhaps a good point to quickly explain the evolution of the golf ball. When the game of Gof or Colf was brought from Holland to Scotland as early as 1300, so the story goes, it was played with a single club, usually in towns and played towards a target such as a door. Early players hit round stones they had picked off the beach. The game began to take shape in Scotland in the 1650s when it was moved out of the towns and onto land beside the east coast towns and ports. It was in Leith where the world's first golf club The Honourable Company of Edinburgh Golfers, was founded. The Stuart monarchs helped to spread the popularity of the game and when James VI of Scotland took the throne of Great Britain as James I he brought golf down to London. The potential for a game of skill was quickly appreciated and so they devised a ball which was called a feathery. It comprised of a small piece of leather, stuffed with feathers - a top hat full was the amount which had to go into the ball -which was then stitched up and rolled until it took up a rounded shape. A big lad, with a strong arm, could probably hit it all of 80 yards. But golf remained very much a reserve of the wealthy and did not really take off until the year 1848 when the new gutty ball appeared, made from malleable gutta-percha. This was a cheap, durable alternative to the short-lived feathery or the wooden ball that preceded it. Researchers came up with a whitish rubbery substance, derived from the coagulated milky latex of the Palaquium tree of Malaya. This was called Gutta-percha. No doubt, this strange substance had been brought to England by a sailor who handed it on until it fell into the hands of a bright spark with the imagination to turn it into a ball. A nice round smooth white ball was just what those pioneering golfers had been looking for. They could hit it a lot further - but it would not go straight. At least, not until its case had been marked with cuts and 'smiles'. So the next generation of ball was made with cuts already made in the cover and these were called Guttys. With that, and the development of better and more versatile clubs, the new well-off middle class created by the industrial revolution started to flock by rail to Scotland for golfing holidays, with Berwick and St Andrew's among the most popular destinations. In return, Scotland sent south a horde of golf course designers and professionals like Willie Dunn, Willie Park - the designer of Hollinwell - and later Donald Ross, to spread the message across the country and on to foreign parts. In 1912 came another major step forward with the development of the Haskell ball. with a rubber core, wound with rubber thread, and a gutta-percha cover. It was a great advance in design and is the model from which today's highly sophisticated golf balls are derived. Those Coxmoor golfers playing in the years between the wars would have appreciated the better quality of ball. They were aiming at much smaller targets than we see today and it is still possible to discern one or two of the smaller, original greens as you walk around the course. On the present eighth, just over the top of the hill, there is the outline of a green on the extreme left of the fairway. And on the 13th, just before you get to the ridge on the right side of the fairway you can make out the shape of an old green. Bill White makes one other fascinating observation about today's layout of Coxmoor. Where, on the earlier holes, you had shots which could result in the ball being pushed out of bounds, no such shots exist today for the right-hander. All the out of bounds areas lie to the left. By now, the rule on caddies at Coxmoor had been relaxed and Bill White recalls there were three regulars available to carry for members, including a man named Jack Smith, and his brother. As far as Bill can recall, they received something like a shilling a bag. For Tom Williamson and Len White, the creation of another new course was another triumph and over the next dozen years, Len and his team of helpers nurtured it along, planting trees, building bunkers, shaping greens and generally producing a course to be proud of. 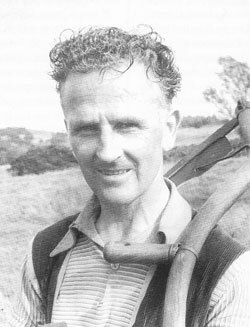 But Len had been at it since 1923 and just after the end of World War Two, no longer enjoying the best of health due to an injury he received while working on the course (which is explained a little later), he went to the committee and asked if he could relinquish his duties of greenkeeper. Len White had given remarkable, dedicated service to the creation and maintenance of the golf course and the committee were reluctant to let him go, but understandably, they accepted his decision. Messrs H. J. Johnson and W. Drury were later appointed to the role of greenkeepers. It was around this time that the club opened up fresh negotiations with Welbeck Estates on the subject of the land they leased - but this time the Coxmoor committee had a new proposition for Welbeck and its owner the Duke of Portland. They announced that the time had come for Coxmoor to be its own landlord and duly offered to buy the course, lock, stock and 18 holes. That was the signal for a series of meetings at which there was much hard-talking, bargaining and the burning of a few gallons of midnight oil before a deal could be hammered out. Initially, the two sides were poles apart. Welbeck wanted the princely sum of £30 an acre for the 161 acres of Coxmoor golf course - a total of £4,830. Coxmoor's officers were mandated to go no higher than £2,500. The negotiations were deadlocked and Coxmoor could not even win permission to secure ten acres for a new clubhouse complex. For the time being, the transaction was put on hold: Coxmoor would reluctantly have to continue as fee-paying tenants of the Duke's estate. By now, Len White's health was beginning to fail him and in August 1947, the committee sadly accepted his resignation as steward of the club. That meant Len and Sarah had to move out of the clubhouse accommodation so they made their new home in Red Lodge, a house in Thoresby Avenue at Kirkby. He would continue as professional however, and the club provided him with a wooden building near the first tee to house his shop while a new couple, Mr and Mrs Harriman, took over the club bar activities. In that same month, E. S. B. Hopkin, the club's secretary since Coxmoor was founded in 1913, also resigned. Mr G. C. Harris was appointed as his paid successor. During the last ten years of Mr Hopkin's reign, most of his duties had been performed by his head clerk Mr Leslie D. Naylor. Although not a member of the club, he sat in at committee meetings to take notes and made weekly visits to Coxmoor, travelling by train from Mansfield and then walking the nine-tenths of a mile up the hill from Sutton Junction station. One of his tasks was to ensure the prompt payment of subscriptions - and quietly bring it to the attention of those who were lagging behind with their dues. A list of the membership was displayed in the clubhouse and as each member settled his account for the year, a red star would be placed beside his name for all to see. In those early post-war years, the subscription fee was four pounds for men, two pounds ten shillings for ladies and fifteen shillings (75p) for non-players. 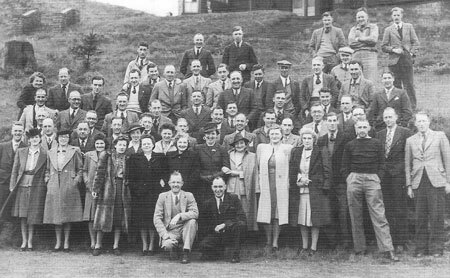 Both Bill and Dorothea White remember the members using the course to create their own fun on those few occasions when it was not fit to play because of snow. They remember organised sledging parties which used to go on well after dark if a full moon was shining, from one side of today's 13th fairway to the other. This was in the days when there were no trees to the right of the fairway, no heather on the bank and it was possible to launch a sledge from the top of the bank. "Lots of members had their own sledges and they could really make them fly down the hill," recalls Mrs White. "The only thing you had to make sure of was that you put the brakes on before you crashed into the hedge on the other side." Hot toddies brought out on trays from the clubhouse helped to keep the cold out and the spirits high. And Dorothy Alberry recalled: "We used to fetch tin trays from the clubhouse and use them as sledges. People used to bring picnics and flasks of soup."